This is a brand new premium WordPress theme designed for your inspiration and self-expression. The theme is craftily made to be applicable for building up a photographer’s portfolio and creating a strong reputation in creatives’ community. This readymade design will be an excellent choice to build a perfect online presence and showcase your best photography works to the target audience. 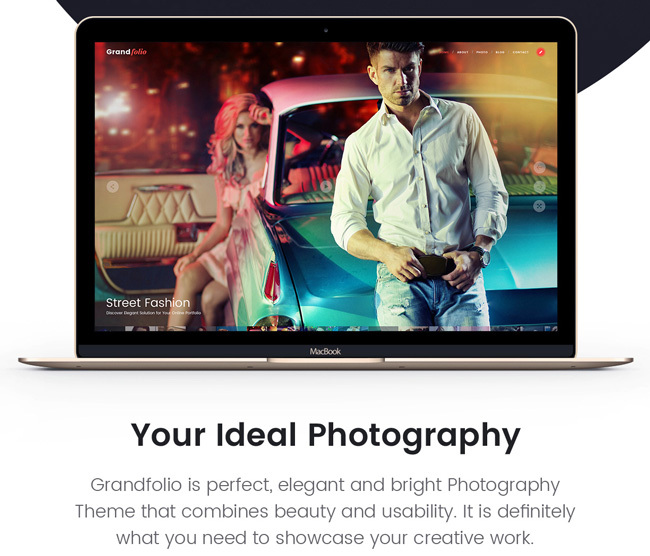 Grandfolio is stuffed with a multitude of features useful to make a full-fledged engaging portfolio website. You can represent your photos as a Fullscreen, Portrait, Kenburns or Ribbon Slider, demonstrate them as albums grid or albums slider, or show them off in a grid or masonry gallery.